FutureForecast is one of the few indicators looking into the future, or rather calculating the current candle's High and Low price values. FutureLow - calculated minimum price line color. The indicator forms two lines. By default, they are of the same color but it can be changed in the Colors section of the indicator settings. 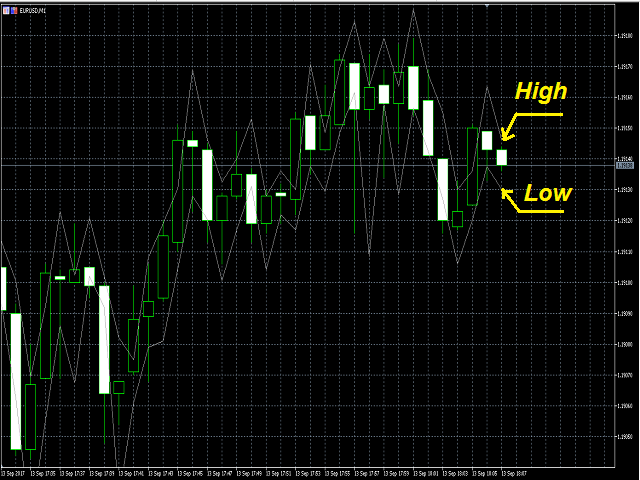 The upper indicator line is a forecast High of the current candle, while the lower line is a forecast Low. Trading should be performed with anticipation of a roll-back from these lines. If the candle Close price breaks the indicator levels, the next candle will most likely make a correction in the opposite direction. Added the Alert function. When the current price reaches one of the calculated High or Low levels, an Alert dialog box is displayed and a sound signal is played.